Like most professional-grade PDF solutions, PDFelement Pro aspires to be a one stop solution for your daily document needs. It’s a single platform to create, convert, annotate, merge, splice and edit your PDFs -- and more. What distinguishes PDFelement Pro, however, are its price, simplicity and breakthrough form tools. The latter we’ll get to in a moment. At about $100 for a perpetual install license, PDFelement’s business software fits well within your average SMB’s budget. You’ll never have to worry about subscription costs piling up over time. On top of that, 6’s friendly Office 2016-inspired interface will absolutely crush your learning curve. Certainly, Excel, Word and PowerPoint lovers will have no problem diving into 6 and getting comfortable. Clearly defined tool icons, a new quick start menu and an updated search function make locating features a breeze. 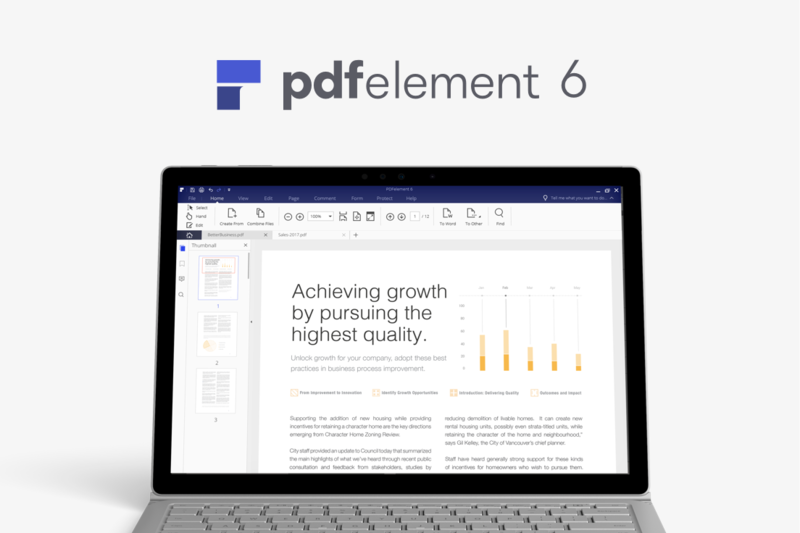 You can also revise documents with a fluidity close to Microsoft Word thanks to PDFelement’s remarkably accurate editing engine. As the cherry on top of the sundae, Wondershare provides a free customer resource center for PDFelement users. This includes numerous video tutorials, a short and long user guide, a community forum, how-to’s and FAQs to answer any outstanding questions you might have. But the software is so intuitive that you can likely plunge into creation with zero assistance. With PDFelement’s Office 2016-inspired interface, Windows users will instantly feel at home. What really distinguishes PDFelement 6 Professional are its form tools. These features improve both your form creation and form data collection. The form recognition feature enables users to quickly convert old static office forms into interactive, fillable PDF forms. Users can then apply PDFelement’s robust form data extraction to their filled PDF forms -- and scanned images of forms -- to cut their data entry times by over 90 percent. Step one to converting your old office forms is using PDFelement’s form recognition tool. First, you need an uploaded copy of your old Excel or Word form -- preferably unfilled. After that’s done, click the form tab and then the form recognition icon in the toolbar. The form recognition feature then identifies form fields in your imported file through a “name/mapping process” very similar to that used in document metadata APIs. Text-based fields and form elements get recognized and tagged, changing static forms into electronically fillable PDFs. Depending on your form’s complexity, PDFelement may recognize every feature perfectly at first go -- or you may have to do some cleanup of misplaced or absent text fields. You’ll be able to easily add or remove fields, and insert custom form elements like checkboxes and radio buttons -- using icons on PDFelement’s toolbar ribbon. The whole process shouldn’t take more than a few minutes. And afterwards, you’ll have an interactive, fully actionable PDF form. Here’s the real kicker: once you’ve distributed your PDF forms and collected information from hundreds of customers, you can use the data extraction feature to radically simplify your form data entry. It doesn’t matter if you’re working with one or countless forms -- PDFelement processes identical forms in a matter of seconds, sparing you hours of typing, and outputting everything into a single accessible .CSV Excel file. PDFelement 6’s data extraction can even be made to work with scanned paper forms. The Data Extraction tool outputs form data from up to hundreds of forms into a single Excel sheet you can open straight from within PDFelement. Simply click the form tab and then the enlarged form data extraction icon. PDFelement then guides you through the stages of the extraction process. At the batch processing window, you can add up to hundreds of identical filled PDF forms. Actual extraction is accurate and fast, taking on average less than a second per document. Afterwards, you can click the finish button to directly open the outputted data in Excel. For those looking for a quick-install and easy-to-use PDF solution that covers all their basic office document needs -- plus form recognition and form data extraction -- PDFelement is the ideal product. And it comes at a competitive price which few professional alternatives can match. You don’t have to pay up front, however, to experience how PDFelement simplies both sides of form data collection. Free trials are available on Windows or Mac for download.